According to developer Remedy Entertainment, Alan Wake's American Nightmare will not be the final adventure of the titular character. Speaking to Joystiq, Remedy CEO Matias Myllyrinne explained the company's stance on Alan Wake as a franchise, more or less telling the site that as long as people keep tossing cash-money at the character, Remedy will continue dropping him into situations that are reminiscent of, but legally distinct from a David Lynch film. "We're crowd pleasers, we'll do what the audience wants, 'cause usually that's the good business move as well," Myllyrinne said. Unlike 2010's Alan Wake, the upcoming Alan Wake's American Nightmare is set to debut on Xbox Live on February 22. Myllyrinne is a big fan of the freedom this digital distribution scheme offers. "I'm loving the digital side and we'll see how that evolves, but just being able to give people quick access to bite-size chunks of gaming is maybe more fun than working for years and years -- taking the phone offline and closing the shutters -- at least, this way, you're able to react much more quickly to people's desires and wishes," he adds. Unfortunately, the firm is unwilling to commit to a solid sequel. "Right now we're focusing on getting the PC out next week, then getting American Nightmare out. And it's too early to talk about what our next move is, but we've obviously put things into motion." Also notably lacking from Myllyrinne's words is any indication of where the franchise might be heading in the future. 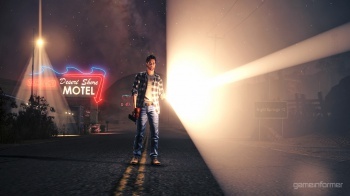 While Alan Wake was a surrealist, atmospheric horror title, American Nightmare pushes the series in a more action-oriented, shooter-esque direction. Is this an ongoing trend? Will Alan Wake 3 offer quick-time fist fights and cover-shooting mechanics? Maybe fatalities and stereotypically weak-willed female companions whose breasts are as unlikely as they are pendulous? Look, Mr. Myllyrinne, I don't want to tell you how to run your business -- obviously a man with so many consonants in his last name knows something about psychological horror -- but please don't turn Alan Wake into yet another gun fight. People loved the original for its cerebral touches, not in spite of them. You might make less money that way, but think of it as yet another overarching homage to David Lynch. Or, at the very least, give us a chance to shoot that creepy baby from Eraserhead. Seriously. What the eff was that all about?